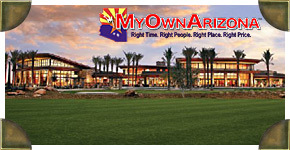 Welcome to the online MyOwnArizona team presentation of Luxury Homes For Sale in Peoria. Search our collection of the finest Peoria homes, estates, and land for sale in the Peoria area. The City of Peoria has some of the finest Vistancia homes for sale available in the entire country. The Peoria real estate market benefits from one of the largest and fastest growing metropolitan area’s in the entire region. The Peoria area boasts many options for shopping, dining, and outdoor opportunities, which are listed for your convenience in our Peoria Resource Guide. Please contact us to receive the packet on Peoria. Trilogy at Vistancia is located in the beautiful foothills of North Peoria. This gated Vistancia community was named America’s Best Master Planned Community. Trilogy has been designed to make it easy for you to create the lifestyle of your dreams and make the most of every day. The heart of the Trilogy at Vistancia community's social life is the 35,000 square-foot resort style Kiva Club. It includes a large living room, billiards den, event room, café, spa and an athletic club, fitness studio, center for higher learning and creative arts studios. Trilogy at Vistancia offers newly constructed homes for residents 45 and older - no permanent residents under age 19 are allowed in this adult community. So if you would like to have a Trilogy at Vistancia home built to your specifications, just contact us. Beautiful luxury developments and communities abound within the areas of Peoria. In the heart of North Peoria you will find urban and upscale lofts with views to take your breath away, and in the surrounding communities you will find truly amazing Vistancia homes for sale. Vistancia homes are abundant throughout our area, and MyOwnArizona's Peoria Homes division has the resources you need to find your dream home. This online resource of Peoria Home offers our clients the best of all lifestyles to be found in this wonderful area we call home. Your North Peoria MyOwnArizona team is the top Arizona realtor group serving the North Peoria homes for sale area in the industry. Let our MyOwnArizona business professionals be of assistance to you and your needs. Contact us at: info@MyOwnArizona.com for North Peoria Arizona real estate.